Long Dat Import - Export and Production Corporation is leader in wood field. We can supply the highest quality of plywood, veneer,... and the best price. We have 10 years experiece of wood product. 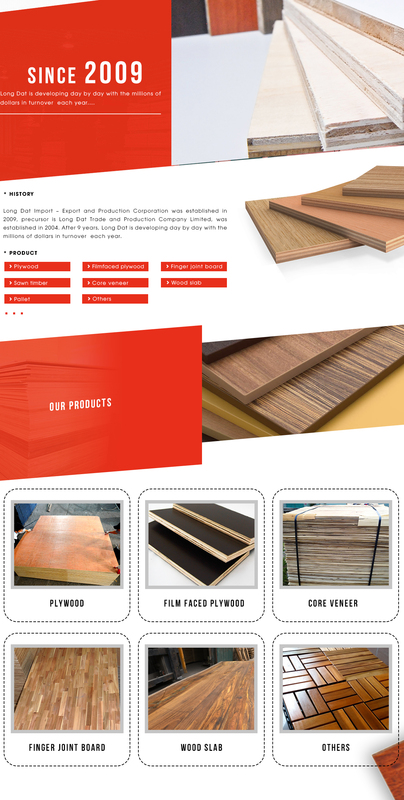 Long Dat Import - Export and Production Corporation are specialized in plywood, MDF, Veneer, wood pallet, block board and other wood products. Our company was established in 2004 and we have many years of history in the wood industry. Our company employs more than 100 workers and through the efforts of our entire workforce, we have become a strong wood manufacturer who are continuously working toward improving product quality. Our company has always focused on research, development and innovation . Long Dat corp believes in reasonable prices, efficient production time and good after-sales service. We hope to cooperate with more customers in the future and welcome all potential buyers to contact us.